This week in our Awakening to Your True Self Series, we continue with the four Brahma Viharas. These translate as supreme states, desired dwelling, divine abiding, or our best home. They include loving kindness, compassion, joy and equanimity. The brahma viharas or the four divine abodes are the teachings on the way we relate to ourselves and others. For example we meet friendly people with love, those who are suffering with compassion, successful people with joy, and unpleasant people with detachment. 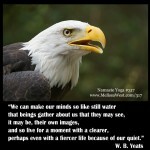 Sharon Salzberg, loving kindness or metta meditation teacher, speaks of the four brahma viharas as our best home. She says, just like our home, we might not be in these states all the time, but we will feel our most authentic and most at ease when we are at home, when we are expressing love, compassion, joy and equanimity. This week, we will finish our mini series on the brahma viharas with the brahma vihara that brings loving kindness, compassion and sympathetic joy into perspective. Equanimity is wisdom, justice, and seeing things as they are. It is said to be a spacious stillness of your mind. The near enemy of equanimity is indifference. With indifference you don’t care, you are angry, you separate yourself and you build a barrier to the difficulty in your life. With equanimity you have the strength to be completely present. Equanimity gives you the courage and determination to face your suffering without becoming grief stricken. It allows us to continually offer loving kindness when it may not be received graciously. It gives us the opportunity to offer sympathetic joy from a big and open space of perspective free from pleasure and pain. The testimonials I read at the beginning are an example of how life is a succession of changing experiences. Just like me, you will receive pleasure and pain, gain and loss, praise and blame and fame and disrepute. Here at Namaste Yoga we have a firm commitment to ahimsa, nonviolence and loving kindness in other words to promote what we love, not bash what we hate. We choose to promote loving kindness, compassion and sympathetic joy with you our students from a place of equanimity. Yet, I assure you we, just like you, experience loss, blame, and disrepute. As human beings we continually move between the experiences of pleasure and pain, gain and loss, praise and blame, fame and disrepute. 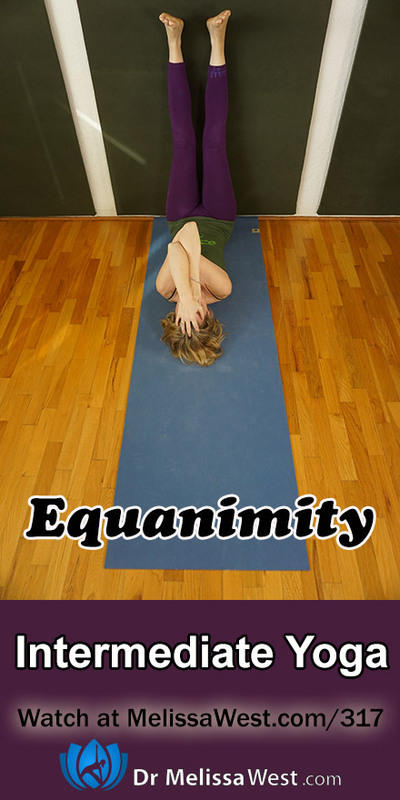 According to equanimity, there is no need to feel betrayed or personally humiliated. We can experience the pain with openness rather than being lost in resistance in fear. Likewise there is no need to only feel fully alive when we are experiencing praise and fame and hold on desperately to pleasure. As human beings we are infinite and open and we are also finite and limited. We are both wonderful and difficult. We are flawed, stuck in old patterns, impossible and we are beautiful beyond measure. Everyone, including myself has relative weaknesses that cause suffering. Everyone also possesses absolute beauty which surpasses these limitations. Equanimity allows us to hold both of these qualities, our weaknesses and our beauty, both, with compassion and perspective. With equanimity we recognize that many things are out of our control. We can offer our actions with the best motives and greatest skills and yet how they are received by others are completely out of our control. Equanimity asks us to trust our actions, honour them and let go. 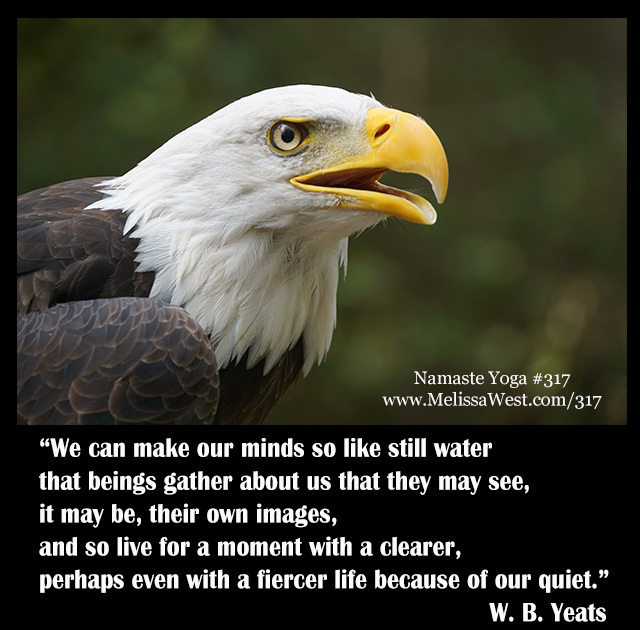 From example the offerings of the teachings here on Namaste Yoga. As you see from the testimonials I shared today, sometimes there is praise and sometimes there is blame. Through my own personal meditation, yoga and journaling practice, I find the space and time to gather perspective, to look at the bigger picture. I recognize that although there are some who experience suffering because of the teachings offered here, there are many more that find loving kindness, compassion and sympathetic joy. Each time Tim presses record I gather the courage to begin again and the discipline to not become overcome by the blame. Today we will be practicing eagle’s pose so that we can back up, zoom out and have the clear perspective and eagle’s vision. Bring to mind an experience in your life where you feel suffering from pain, loss, blame or disrepute. Keep that in mind as we move through the postures, so that together we can move beyond the limited experience of the moment and see the bigger perspective free from blame, pain and loss, the wide open sky of peace known as equanimity. We can hold the impossibility of ourselves and the beauty of ourselves and others simultaneously in the same way as the sky holds the clouds with a gentle, spacious equanimity. Thank you for your donations Catherine, Donna, and Sean, we appreciate your support immensely. If you would like to make a donation to Namaste Yoga you can click here. You can also contribute through your time by commenting in the comments section. Today’s question to answer in the comments is: What humanness, difficulty, flaw, impossibility, pattern are you zooming out to bring the equanimity of perspective, compassion and loving kindness to this week? We can access the power of equanimity through loving kindness. If you would like my favourite phrases of loving kindness meditation so you can practice loving kindness meditation at home then you can opt in below to receive a beautiful infographic with those phrases. If you would like more support in practicing loving kindness meditation, then I would highly recommend starting a loving kindness meditation practice. In our meditation community we are currently setting up a loving kindness meditation group and we already have a loving kindness meditation retreat with several loving kindness meditation audios to support you in your loving kindness meditation practice.